In 1997, I began a photodocumentary project on genocide in Rwanda, visiting two infamous genocide sites and the Kigali area. I only spent two weeks in that central African nation, but the experience profoundly moved me and changed my life. 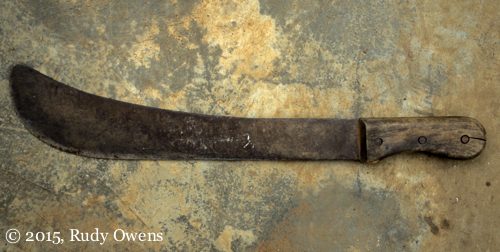 The machete, a common tool found in nearly every Rwanda household, was the principal murder tool of the 1994 genocide in Rwanda. I photographed this in the backyard of a Rwandan home in 1997. In the spring and summer of 2000 and fall of 2001, I completed the second phase of my visual exploration of genocide in the 20th century by visiting Nazi camps and Holocaust sites in seven European countries. In October 2001, I completed the project by visiting historic sites associated with the genocide of the Armenian people by the Ottoman Turks during and after World War I. My work on this difficult topic ended shortly after, in 2002. My photos have been published on my Web site and magazines, and they were displayed in numerous photo shows in the Seattle, Wash., area. My photos and stories continue to draw thousands of visitors every week to my Web site, which I will continue to publish as a free on-line resource for the public. I hope these images and stories will be useful for those who want to learn about crimes against humanity, how they occurred, and what forces motivated the perpetrators of these unspeakable acts. As a photographer and documentarian, I moved on to other projects–focussing on the human potential for goodness. I am still keeping my content online to inform anyone who is doing online research. I still get notes from the public, around the world about this work. Images also can still be licensed to media organizations, publishers, and individuals. Finally, I will make a personal note about this project. It began in a dark place, not long after the massacres of Hutu moderates and ethnic Tutsis in Rwanda. On that trip in June 1997, I developed malaria, which in part led to my decision to leave the country. In November 2001, soon after my trip to Turkey photographing Armenian genocide and cultural sites, I visited Netherlands. I travelled to Camp Westerbork, the main deportation center for Jews in occupied Netherlands in World War II. The camp was the staging ground for the deportation of mostly Jewish civilians to death camps in Poland and other concentration camps in Nazi Europe. I suffered a strange and painful relapse of malaria at the camp, and had to visit a hospital that night for care. This was not a coincidence, as I recently realized. The physical and psychic journeys had taken their toll, and it was clear I needed to put this project behind me. In 2002, I tossed a small item, a piece of an electrical transformer I found at the death camp Birkenau, into the Puget Sound, as part of my ritual ending a stage of my creative life. In June 2002, I marked the end of this journey by donating my entire collection of more than 50 framed black and white and color framed photographs to the Washington State Holocaust Education Resource Center of Seattle, Wash (now called Holocaust Center for Humanity). My hope is that the pictures will continue to provide insight for the Holocaust studies and human rights education the center provides to residents of Washington state and the Pacific Northwest. As I now look back on this project, from its start almost two decades ago, it is good to remember what I learned, and it also is valuable to realize when change is good and you need to move your creative energies in new, and also positive, directions. Always.